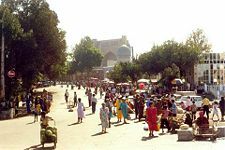 Samarkand (Uzbek: Samarqand, Самарқанд), is the second-largest city in Uzbekistan and the capital of Samarqand Province. One of the oldest cities of Central Asia, the city is most noted for its position at the junction of trade routes on the Silk Road between China, India, and the West, and for being an early Islamic center for scholarly study. Samarkand revolted against its Mongol rulers in 1365, and became the capital of the empire of Timur, during which time it made its most significant development and became the most important economic and cultural center in Central Asia. 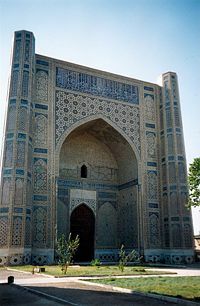 In Islamic literature, Samarkand has taken on a semi-mythological status and is often cited as truly representing Islamic philosophy and society. It is noted as a place of justice, fairness, and righteous moderation. 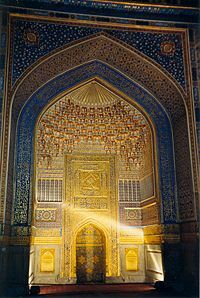 In literature, Samarkand is portrayed as an archetype of romantic exoticism. The city's historic section was designated a UNESCO World Heritage Site in 2001. Its most magnificent features are the ancient buildings' splendid portals, vast colored domes, and remarkable exterior decorations in majolica, mosaic, marble, and gold. Listed by UNESCO as Samarkand - Crossroads of Cultures, it is noted for its magnificent Islamic architecture whose influence can be seen from the Mediterranean to the Indian subcontinent. Samarkand is also well noted for its contributions to Central Asian cultural and political history from the thirteenth century onward. Samarkand derives its name from the Old Persian asmara, "stone," "rock," and Sogdian kand, "fort," "town." Samarkand is located in the valley of the Zeravshan River, at an elevation of 2,375 feet (724 meters) above sea level. 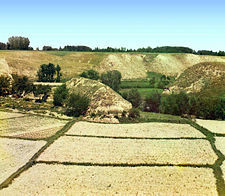 The land surrounding Samarkand is arid and windswept. Samarkand has a mostly mid-latitude desert climate, with long, hot summers, and mild winters. The average maximum daytime temperature in January is 44°F (6°C), rising to an average maximum of around 92°F (33°C) in July. Mean annual precipitation is 9.2 inches (236mm). Environmental issues relate to the heavy use of agrochemicals during the era under the Soviet Union, when diversion of huge amounts of irrigation water from the two rivers that feed Uzbekistan, and the chronic lack of water treatment plants, have caused health and environmental problems on an enormous scale. Samarkand comprises an old medieval city and a new area built after the Russian conquest in the nineteenth century. Downtown Samarkand with Bibi Khanym mosque in the background. 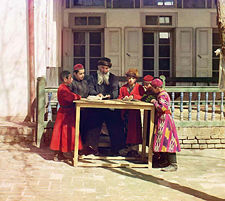 Jewish Children with their Teacher in Samarkand, early 1900s. Ulugh Beg's astronomy observatory, which in his time were lined with polished marble walls. Founded circa 700 B.C.E., Samarkand was the capital of the Sogdian satrapy under the Achaemenid dynasty of Persia when Alexander the Great conquered it in 329 B.C.E. Although a Persian-speaking region, it was not united politically with Iran between the times of Alexander and the Arab conquest. The Greeks referred to Samarkand as Maracanda. In the sixth century it was within the domains of a Turkish kingdom. At the beginning of the eighth century, Samarkand came under Arab control. Under Abbasid rule, the legend says, the secret of papermaking was obtained from two Chinese prisoners from the Battle of Talas in 751, which led to the first paper mill in the Islamic world to be founded in Samarkand. The invention then spread to the rest of the Islamic world, and from there to Europe. From the sixth to the thirteenth century, Samarkand grew steadily and was controlled by the Western Turks, Arabs (who converted the area to Islam), Persian Samanids, Kara-Khanid Turks, Seljuk Turks, Kara-Khitan, and Khorezmshah before being sacked by the Mongols under Genghis Khan in 1220. A small part of the population survived, but Samarkand suffered at least another Mongol sack by Khan Baraq in his quest to obtain the treasure he needed with which to pay an army. The town took many decades to recover from these disasters. Marco Polo (1254-1324), who recorded his journey along the Silk Road, described Samarkand as a "a very large and splendid city..." He also related the story of the Christian church in Samarkand, which miraculously remained standing after a portion of its central supporting column was removed. In 1365, a revolt against Mongol control occurred in Samarkand. In 1370, Timur the Lame, or Tamerlane, decided to make Samarkand the capital of his empire, which extended from India to Turkey. During the next 35 years he built a new city and populated it with artisans and craftsmen from all of the places he had conquered. Timur gained a reputation as a patron of the arts and Samarkand grew to become the center of the region of Transoxiana. During this time the city had a population of about 150,000. In 1499, the Uzbek Turks took control of Samarkand. The Shaybanids emerged as the Uzbek leaders at or about this time. In the sixteenth century, the Shaybanids moved their capital to Bukhara and Samarkand went into decline. After an assault by the Persian king, Nadir Shah (1698–1747), the city was abandoned in the eighteenth century, about 1720 or a few years later. From the 1720s to the 1770s, Samarkand was nearly deserted, and the madrases on the Registan were turned into winter stables by nomads. 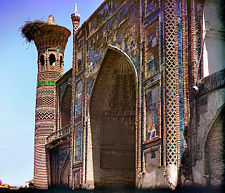 From 1784, Samarkand was ruled by the emirs of Bukhara. The city came under Russian rule after the citadel had been taken by a force under Colonel Alexander Abramov in 1868. Shortly thereafter, the small Russian garrison of 500 men were themselves besieged. The assault, which was led by Abdul Malik Tura, the rebellious elder son of the Bukharan Emir, and Bek of Shahrisabz, was beaten off with heavy losses. Abramov, now a general, became the first Governor of the Military Okrug which the Russians established along the course of the River Zeravshan, with Samarkand as the administrative center. The Russian section of the city was built after this point, largely to the west of the old city. The city later became the capital of the Samarkand Oblast of Russian Turkestan and grew in importance still further when the Trans-Caspian railway reached the city in 1888. 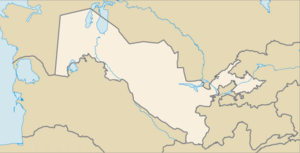 It became the capital of the Uzbek SSR in 1925 before being replaced by Tashkent in 1930. Since somewhat reluctant independence from the Soviet Union in August, 1991, Uzbekistan has struggled with Islamic terrorist attacks, and authoritarian rule. Uzbekistan is a republic noted for authoritarian presidential rule, with little power outside the executive branch. Uzbekistan is divided into 12 provinces (viloyatlar). Samarkand is the capital of the Samarqand Viloyati, which is divided into 14 administrative districts. Uzbekistan has issues with terrorism by Islamic militants, economic stagnation, and the curtailment of human rights. Uzbekistan in 2008 was the world's second-largest cotton exporter and fifth largest producer, relying heavily on cotton for export earnings, along with gold, natural gas, and oil. Uzbekistan's per capita gross domestic product was estimated at $USD 2400 in 2007. 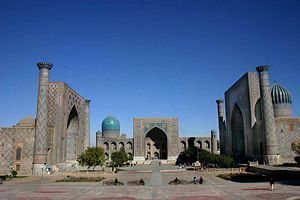 Samarkand is the second largest center for economy, science, and culture in Uzbekistan, after Tashkent. The Registan, Shahi Zindah, and other ancient sites should be swarming with tourists, but in 2008 there were few groups of foreigners gaping at the marvels. In a country where statistics are a state secret, it is unclear how many foreign tourists visit and what revenues they bring in. Samarkand province has significant natural resources, including marble, granite, limestone, carbonate, and chalk. Main agricultural activities include cotton and cereal growing, winemaking and sericulture (the rearing of silkworms for the production of raw silk). Industry involves manufacturing spare parts for automobiles and combines, food processing, textiles, and ceramics. The city's population in 2005 was 412,300 people. Dark-haired Uzbeks make up 80 percent of Uzbekistan's population, while Russians make up 5.5 percent, Tajiks five percent, Kazakhs three percent, Karakalpak 2.5 percent, Tatar 1.5 percent, other 2.5 percent. Most speak Uzbek (74.3 percent), while 14.2 percent speak Russian, 4.4 percent Tajik, and 7.1 percent speak other languages. Most (88 percent) are Sunni Muslims, nine percent are Eastern Orthodox, and the remainder adhere to other religions. The Institute of Archeology at the Academy of Sciences of the Republic of Uzbekistan is based at Samarqand. Notable People born in Samarkand include Babur Al-Sultan al-'Azam wal Khaqan al-Mukarram Zahir ud-din Muhammad Jalal ud-din Babur Padshah Ghazi (first ruler of Mughal India), Qulich Khan Siddiqi and Ghazi Uddin Khan Siddiqi, father and grandfather of Nizam I (Qamaruddin Siddiqi Asaf Jah I of Hyderabad India), and Islom Karimov, President of Uzbekistan. Bibi Khanym Mosque, which was built between 1399 and 1404 by Timur using precious stones captured during his conquest of India, was one of the Islamic world's largest mosques which crumbled for centuries before collapsing in an 1897 earthquake. Ulugh Beg Observatory, which is a small museum of astronomy that stands on the remains of the observatory of Ulugh-Beg, a Timurid ruler and astronomer. The Shahr-i-Zindar Monuments, which are tombs belonging to Timur and his family and favorites that are decorated with the city's finest majolica tilework. 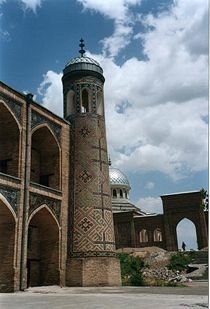 The Sher Dor, Ulugbek, and Tillya Kori Madrasahs, which are the three Muslim clergy academies surrounding the Registan. The Afrasiab, which is the site of an ancient settlement that existed more than two thousand years ago. The Gur Emir Mausoleum, which is the grave of Timur, built in 1404. Samarkand's old buildings stand as monuments to vanished glory—in 1370 it was the capital of Timur's empire while in 1770 it was nearly deserted. While Uzbekistan struggles with acts of terrorism perpetrated by Islamic militants, economic stagnation, and the curtailment of human rights, Samarkand's famous buildings could attract a steady flow of international visitors each year, which could be a goldmine for the city's economy. ↑ 1.0 1.1 1.2 1.3 Columbia-Lippincott Gazeteer (New York: Columbia University Press, 1972 reprint). ↑ S. Quraishi (1989), A survey of the development of papermaking in Islamic Countries, Bookbinder (3): 29-36. UNESCO World Heritage Centre. Samarkand – Crossroads of Cultures Retrieved October 13, 2008. World Fact Book. 2008. Uzbekistan Retrieved October 9, 2008. Murder in Samarkand by Craig Murray.